Make Reservations and e-mail. Caraka Travelindo in Sulawesi Indonesia. 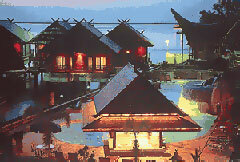 Travelling Agency for a romantic or adventure holiday travel trip in Indonesie, Asia. We can offer you scuba diving, snorkeling with dolphins and whales, mountains and trekking, sailing and white or wild water rafting, tropical island, lake and beach with hotel, appartment and car rental. CARAKA Travelindo offers many tailor made tours throughout Sulawesi with a flexibility to suit your personal preferences and specific needs. We can help you plan your programme, reserve flights and book hotels as well as making specially requested tour arrangements. We also offer onwards on-going flight reconfirmations. Car rental only is also possible. All transportation Caraka Travelindo, all cars with air conditioning and reclining seats. Next to the Caraka Travelindo, Caraka owns the four - star resort Hotel Pantai Gapura Makassar in Makassar and the 4-star resort Hotel, Marante in Toraja . For these Hotels we do offer very special prices. Hotel Pantai Gapura Makassar, located down town Makassar on the waterfont. Standard rooms (wing) and newly build cottage over the sea All rooms equipped with private facilities, safe, minibar, telephone and Satelite TV Swimmingpool with waterfall, sunset bar, orchid garden and phinisi restaurant. Hotel Marante Toraja, set amid spectacular scenery in the heart of Tana Toraja. All rooms equipped with private facilities, minibar, satellite TV and telephone Swimmingpool, bar, terrace and indoor restaurant. Ofcourse Caraka Travelindo makes hotelreservations in all hotels throughout Sulawesi and not only in the hotels owned by Caraka. The best deals for Bali and beyond. Book at Manumadi and save on your dream holiday. Komodo Flores Travel is an experienced inbound travel agency combining Indonesian hospitality with European know-how. We design tours to all the major Nusa Tenggara islands: Lombok, Sumbawa, Sumba, Timor and Alor. From our Bali and Flores offices we organize tailor-made programmes for our guests. Flores will seduce you with its overwhelming natural beauty. In awe of its sheer wild nature, Portuguese colonizers baptized the island ‘flowers’. The highlights of our overland tours include a trek to the traditional Manggarai mountain villages around Bajawa or a hike up to the incredible three-coloured crater lakes of Kelimutu.